The purpose of this CCNP GNS3 lab is to gain a better understand of how to configure EIGRP over frame-relay in a hub and spoke configuration on Cisco IOS routers. 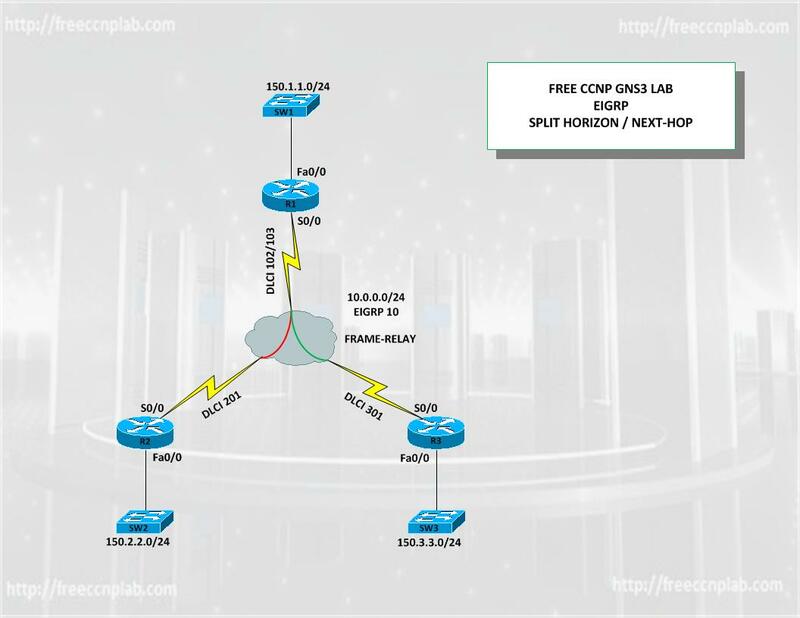 In this lab we will use GNS3 to model a simple lab to demonstrate how to configure and verify EIGRP using the split horizon rule and the next-hop command. Split horizon is turned on by default. When changing the EIGRP split horizon setting on an interface, it resets all adjacencies with EIGRP neighbors. Split horizon should only be disabled on a hub site in a hub-and-spoke network. Disabling split horizon on the spokes drastically increases EIGRP memory usage on the hub router, as well as the quantity of traffic created on the spoke routers. The EIGRP split horizon behavior is not controlled or influenced by the ip split-horizon command. EIGRP routing updates have always contained the next hop field and it was not used until Cisco IOS release 12.3 when the no ip next-hop-self eigrp AS-number interface configuration command was implemented. EIGRP does not set the next hop field by default. An EIGRP router receiving a routing update thus assumes that the next hop of the received routes is the sending router. This behavior works well in partially meshed NBMA networks, but prevents site-to-site shortcuts to be established in DMVPN networks. With the no ip next-hop-self eigrp command configured on an interface, an EIGRP router will set the next hop field in outgoing routing updates if the IP next hop in its EIGRP topology table belongs to the IP subnet of the outgoing interface. The next hop field is set in internal as well as external EIGRP routing updates, optimizing traffic flow in route redistribution scenarios.